Irony in Music: BNL's "Shopping"
Last year before April Fool's, I wrote about Rickrolling, or infusing an otherwise innocuous piece of music with new, comical meaning. This week, I want to write about irony in music, or using music to make lyrics mean exactly opposite their surface meaning. Everything will always be all right, when we go shopping. Well you know it's going to be all right, when we go shopping. la, la, la, la, la, la, la, la, la…everybody wins. Let's shop, until we drop. La, la, la, la, la, la, la, la, la…shopping with our friends, shopping once again. It's never enough, until you've got all the stuff. When the going gets rough, just shop with someone tough. It's always la, la, la, la, la, la, la, la, la...when we go shopping, when we go shopping, when we go shopping. At first glance, the lyrical content of "Shopping" is pretty flimsy. Mostly it's just "all right", "shopping", and "lalala". And the instances when it's not, the rhymes are all short, masculine (meaning one-syllable), and inane. And don't always rhyme very well. The music at first seems to mimic the lyrics—it's peppy and electronics-heavy and something one might hear at a store in the mall. The problem comes when one thinks about actually having these lyrics playing in a mall. The music in the mall is designed to get people to buy things—but actually stating that in the music would pretty much negate any chance at compulsion. It's just too much. Also, BNL as a band is usually pretty verbose in their lyrics, and even in the funnier songs usually display some lyrical depth. The fact that the band chose to have such simple, silly lyrics must be purposeful. The only conclusion is that they must be making fun of shopping—meaning their true message is that everything is not all right "when we go shopping." A closer look at the musical form of "Shopping" reveals that it's much more complicated than it initially seems, too. No musical material is ever presented the same way twice. For example, the first chorus has an extra line, the second chorus plays once, and the third chorus plays twice. And there's little complex touches, like the vibraphone and the ethereal "hahaha" laughing, that show extra thoughtfulness to a song that wouldn't seem to deserve that detail. The string quartet right before "It's never enough…" is the final cherry on top of this irony sundae: the strings attempt to add some gravity to music that on the surface seems completely fluffy and light. And not coincidentally, the string quartet entrance highlights the one line that leaks the real intent of the words: "It's never enough, until you've got all the stuff". If everything is always all right when we are shopping, why is the shopper unsatisfied? Suddenly, other lines seem problematic, too, like "everybody wins"—we know this is not true when we consider conditions for garment workers in Bangladesh, for example. Shopping in a modern store, as much as they try to hide it, can actually mean dooming some people in other parts of the world. The take-away I'm hoping to convey here is that analyzing a song's lyrics without also looking at the music is really not getting the whole picture—not by half, at least. Do you have any examples to share of musical irony? I'd love to hear them. Sting in AmeriGrove, or I'm an expert! Several years ago, I was asked to be a contributor to the second edition of the Grove Dictionary of American Music (or AmeriGrove for short). AmeriGrove is a scholarly dictionary of music and musicians, but focuses on American music specifically. The topic about which I was asked to write was Sting. "Wait," you say, "Isn't Sting a British musician? 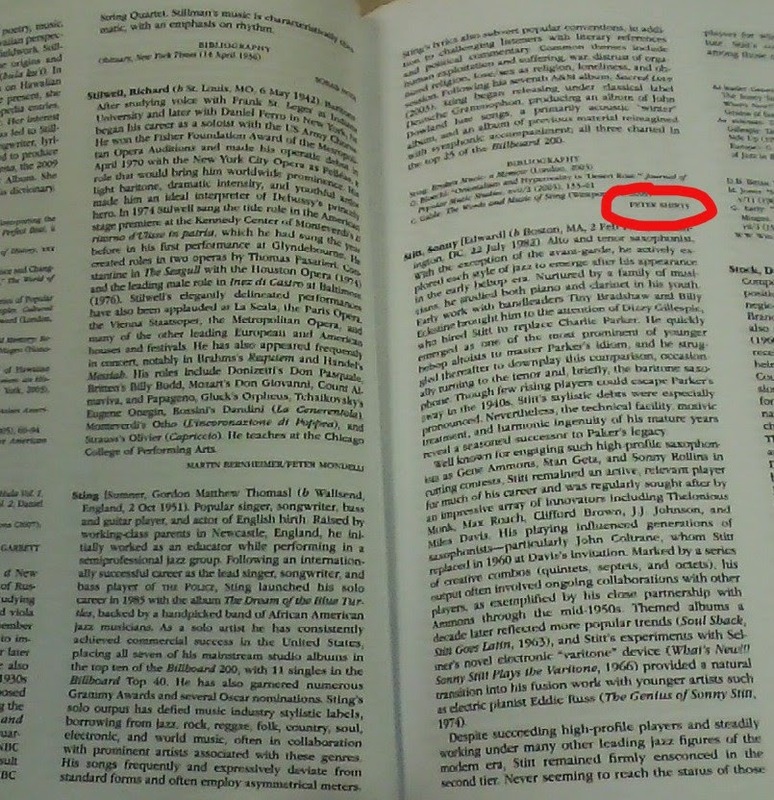 What's he doing in a dictionary about American music?" I asked the same question, actually, and the editors felt that Sting has had an important enough impact on American music to be included. I was happy to oblige. Of course, with the huge scope of the project (more than 9000 entries), publication moved slowly, but the final print version was released earlier this year. A downside to the slow pace: I wrote the article in 2011, and it is already out of date. Get out the magnifying glass—that's my name. In print. What did I get for my 250-word article? $25 and 50% off the $1200 sticker price for the full 8-volume AmeriGrove set. Needless to say, I didn't take advantage of the discount, but my real reward was that I get to say 1) I'm published and 2) I'm an expert. My article hasn't quite made it to the online version of Grove, Oxford Music Online (they're adding them a few at a time), but soon those of you who have access to that database will be able to read the article at your leisure. My guess is this is the last time that Oxford does a print version of a large reference work—the next one will be entirely online. There was a blog post on NPR today about the many common misconceptions about what is traditionally Irish—the Irish don't dye their food green, and in Ireland cows were mostly used for milk until the beef-loving British colonized the island (and tried to wipe out their language, culture, and royalty—and pretty much succeeded). In my opinion, St. Patrick's day shouldn't be about drinking beer, wearing green, and eating green things, but celebrating rich culture. The best way to celebrate culture is to experience it. I had a friend who went to Ireland this past week, which made me think of my own too-short trip. I'd love to go back and drive along the west coast, stopping to hear music on the way. If you can't join 'em, listen to 'em! The Thistle and the Shamrock with Fiona Richie. This weekly NPR show features the music of both Scotland and Ireland, and is actually produced out of Charlotte, NC. Why North Carolina, you ask? Well, is was one of the centers of Irish and Scotch-Irish immigration to the U..S. You can check if the program airs in your area on the site. One problem with the show, however, is that it usually airs at some horrible time, like Saturday at 7pm, when most people (including me) have other things planned. Also, the podcast is only short segments of the show that come out every six months or so. But you can stream current episodes. Ceol na nGael. It's a weeky New York-based Irish culture show that is broadcast from Fordham University. It airs Sundays from 12-4pm, and besides music, it features sports and Irish news. And since most of you are not in the broadcast area, you can also stream current and recent episodes online. This week, I'm doing something that I haven't done before on this blog: review an album that hasn't been released nationally yet. This is possible because I got an advanced copy from one of the members of the group, who I know (full disclosure). 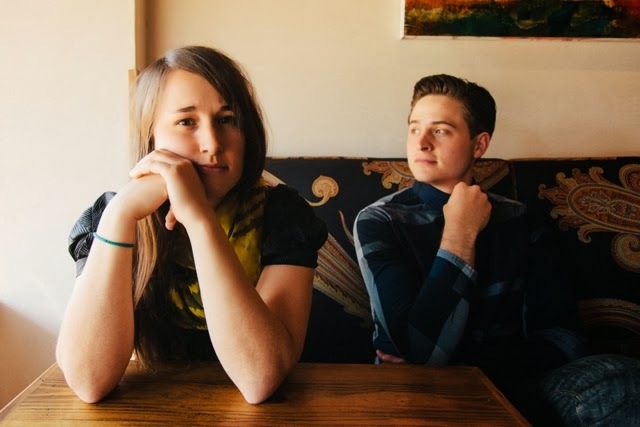 Mideau is a Utah-based electro-pop duo that has been doing live shows for a while now, but this album is their first. The two musicians that make up Mideau, Libbie Linton and Spencer Harrison, co-write their music and switch back and forth between many instruments. You can listen to an NPR feature on Mideau here. Their eponymous album, though mostly subdued from start to finish, rewards with repeated listenings. Though the words are sometimes oblique, the production detail is striking. The varied, rich textures of "Maude" are a microcosm of the album—Mideau is never happy to sit on one groove for long, instead changing up the timbre and texture from one moment to the next. Yet, the songs are still unified. Because of this rapid change, it's just not possible to get the feel of a song in the first few seconds in this album, which sets Mideau apart from many other groups, especially in electronica. Even the second-tier songs have rewarding moments. The highlight of the album is "Opelika". It's probably the most forward-moving, energetic song here, and features a well-placed ukulele. It also makes the best use of both a drop return to a catchy chorus and the interaction between Mideau's two vocalists. My second favorite would probably be "There, There", which I think has the least opaque and most elegant of the lyrics on the album. It's harmonic palate reminds me of classic Simon and Garfunkel. It's not a perfect album: I wish Linton had a little more variety in her vocal style—it would be nice to hear some in-your-face singing to contrast her predominant carefully controlled and conditioned sound. Also, for my taste, some of the songs end a bit suddenly. One song, "Feet to the Sun" may have the most understandable controlling metaphor, but the music uncharacteristically fails to keep my attention as the song progresses. While the album has not been widely released, you can check out the Way with Words EP on iTunes, which features some of the tracks (though none of the specific tracks I mention here, actually). Also, this week the band is making their debut at the South by Southwest (SXSW) music festival, which takes place in Austin, Texas March 11-16. If you are somehow lucky enough to be at that famously large and expensive festival, I would endorse seeing them. Have any of you heard Mideau live? What do you think? It may seem strange to review music that came out two years ago, but Solas is still in the middle of a long tour with the Shamrock City program, with a performance this week (March 7) in Raleigh. I saw an early version of the Shamrock City tour in Ann Arbor, Michigan on Feburary 14, 2012, before the album had even come out and was impressed at the new material and novel direction. Just as background, the Irish-American group Solas has been an important band in Celtic music since their eponymous first album in 1996. After three incredible albums, the membership of the band went into flux, though the founding core couple/duo of Winifred Horan (fiddles) and Séamus Egan (multi-instrumentalist) has remained constant. The band took some different creative directions for the next several albums (including a bizarre flirtation with pop music). In 2005, however, the band returned from mediocrity to more traditional music with Waiting for an Echo and have put out several solid albums since. In a change from the previous work, their latest project, Shamrock City, has an overarching theme—the album of original music is kind of a creative nonfiction/family history project about Michael Conway, Egan's great-great uncle, who immigrated in 1910 from Ireland to the mining town of Butte, Montana. At the time, Butte had one of the highest concentrations of Irish outside Ireland in the whole world, due to an Irish mine supervisor (though Butte's mining jobs attracted people from all over the world, too). While there's not a storyline, per se, the album does have a subtle plot arc, beginning with hope, moving on to gritty determination, and ending in disillusionment. The audience is invited to put themselves in the immigrant's shoes, especially in "No Forgotten Man", a plea to not mistreat or forget those people doing the dirty work, including those in the military. While the songs are mostly original, Solas is entrenched enough in traditional forms to convincingly dress up their songs to fit the mold while keeping a fresh contemporary folk flavor. The band shines in their instrumental tracks, as always, particularly the fast dance pieces like "Girls on the Line" and "High, Wide, and Handsome". They are masters at writing exciting melodies and mixing up timbres, using Egan's multi-instrumentalist talents to their fullest. But the songs, the focus in Shamrock City, are strong, too. Although since Karan Casey left the group, Solas had not had a regular singer, the band worked this to their advantage in Shamrock City, inviting several strong guest vocalists to help tell the story. "Lay Your Money Down", which portrays the character of a mining town gambling house, is probably the strongest, with vocals by Rhiannon Giddens of the Carolina Chocolate Drops, who I believe is touring with the group. Hopefully, their newest lead singer, Irishwoman Noriana Kennedy, will stick. Shamrock City's version of creative family history shows that this genre has promise, with a compelling real-life story dressed up in song. The end result actually has a lot in common with Sting's recent musical/album The Last Ship, including the labor/working class theme. And while Shamrock City does not reach the level of the three early Solas albums, it is a great listen with a compelling and moving story.